Since thin chicken breasts cook substantially faster than traditional breasts or thicker cuts of meat, its easy to get dinner on the table quickly. It's also easy to overcook the meat, which would leave you with a flavorless, leathery main dish. Because they are already so thin, you don't need to pound the chicken before creating fancy roll-ups or throwing them on the grill. 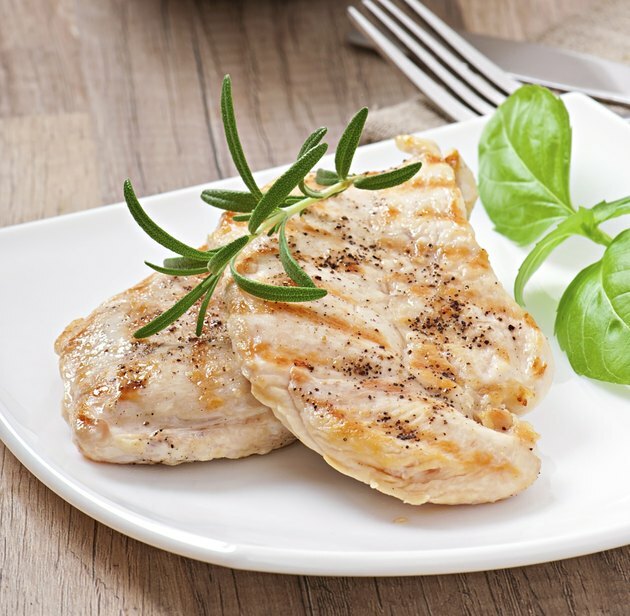 Like other types of chicken, thin breasts have a neutral flavor that's easily changed by switching up your seasonings, marinades, sauces or toppings. Season the chicken breasts on both sides using salt and pepper or any combination of herbs, seasonings or marinades that you like. Because chicken has such a relatively neutral flavor, it pairs well with a range of herbs and seasonings, including lemon, garlic, basil, oregano, cumin and rosemary. Clean the grill with a grill brush and preheat it to medium-high heat. Brush oil or spray cooking spray onto the grates to keep the chicken from sticking. Optionally, leave one burner unlit, or rake the coals to one side to keep a cooler cooking zone. If the chicken browns quickly but needs more time to cook it through, finishing it on the cooler part of the grill keeps it from drying out. Grill the chicken breasts over medium-high for one to two minutes per side or until an instant-read thermometer reaches 160 to 165 degrees Fahrenheit. Removing the chicken at 160 F is acceptable, since the internal temperature will continue to rise to 165 F while the meat rests. Set your oven temperature to between 400 F and 450 F. While the oven is heating up, season the chicken on both sides with salt and black pepper or your favorite seasonings. Lay the meat flat on a cutting board. Place your filling ingredients on top of each chicken breast; for example, use a soft, spreadable cheese such as goat cheese or cream cheese, mozzarella, lean ham or pancetta or vegetables such as asparagus or spinach. Roll each chicken breast and secure with a toothpick or skewer. Spray your baking dish with non-stick spray, then arrange the roll-ups in a single layer. Drizzle sauce or marinade over the top of each roll-up to coat the chicken, then place the baking dish in the oven. Bake the chicken roll-ups for roughly 25 minutes, or until the internal temperature of the chicken reaches 165 F when you check it with an instant-read thermometer. Brining thin chicken breasts by soaking them in a salt water solution before grilling them can keep the meat moist, preventing it from becoming dried out and leathery after being exposed to the heat of the grill. Dissolve 1/2 cup of kosher salt or 1/4 cup table salt, for every quart of water used to make brine. Add additional herbs or spices, if desired and brine the chicken for roughly 30 minutes before grilling it. Keep the chicken refrigerated until you're ready to use it, and always wash your hands and any surfaces that come into contact with raw meat to prevent the spread of any food-borne bacteria.